Well, football fans, it’s almost that time of year again, so bust out that favorite jersey and pull up that recipe for guacamole dip. Saturdays and Sundays are about to get exciting again. And since this could definitely be your team’s breakout year, you might want to catch every action-packed minute with a brand-new TV. Of course, there are a lot of TVs out there—even smart TVs –with dozens of brands clamoring for our attention and bucks. Before you go running out to your local electronics retailer, though, careful research is required. And it just so happens that, like a Pro Bowl cornerback, we’ve got you covered. Bigger may not always be better in every area of modern life, but when it comes to buying a TV, you’ll want to buy the largest screen TV that your room, viewing distance, and budget will allow. Today’s televisions offer incredible detail, which means that while you can sit closer to your television, you won’t want to be so close that you can see the screen pixels. Then again, sit too far away and you’ll miss what you’ve paid for. An excellent rule of thumb when it comes to viewing distance is: Measure the inches of your viewing distance—how far away you plan on sitting from the TV. Next, divide by three. Voila, that’s the size screen you’ll want. For example, if your couch is 120 inches from where you plan on putting the TV, your screen size should be approximately 40 inches. As you’re deciding on exactly how big to go, remember to think about screen resolution. For a TV 40 inches or smaller, you’ll want a screen with a pixel resolution of at least 720p. As you go bigger, though, you will see real clarity benefits with a pixel resolution count of up to 1080p, or “full HD.” You may also be interested in the latest TV tech: Ultra HD, or 4K. Regardless of what kind of TV you choose, the screen size ratio will work. Once you’ve considered your viewing distance and pixel count, you’ll want to consider viewing angle. Always do your best to keep your TV screen straight on and at eye level, give or take 15 degrees. If you must put your TV in the corner, be sure to keep your furniture arranged so that nobody’s viewpoint is more than 40 degrees to the left or right. Light from lamps and windows is also a factor when it comes to achieving the perfect picture. A little light is a good thing, helping to prevent eye strain, but light from windows behind the TV can make it difficult for your eyes to adjust, so consider some sort of window treatments to use during game time. If TV glare is a factor, you may be in the market for an LCD TV, as their anti-reflective screens minimize that sort of light. Also, make some room in your budget for a proper TV stand or wall mounting, if needed. Wall-mounting is the best way to go if you’ve got small children in the house. If you plan on placing the TV on a stand or other furniture, consider a safety strap. 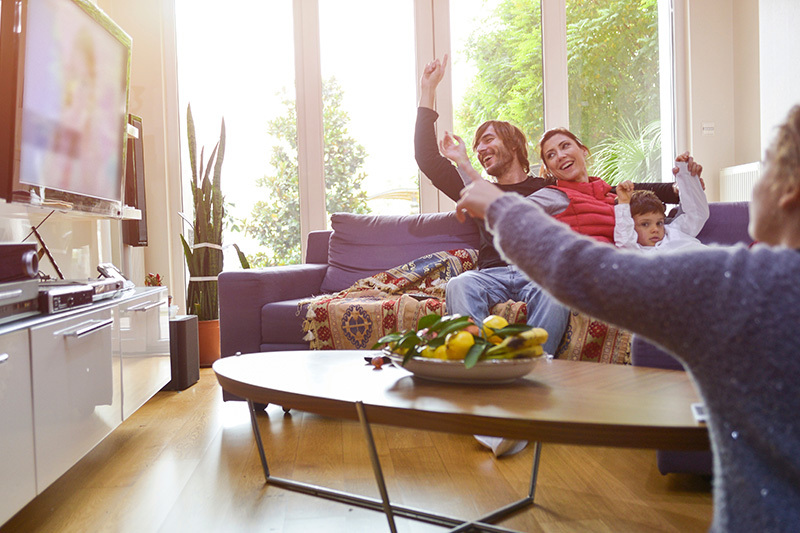 Finally, don’t forget, *TVs are most susceptible to damage and problems during the summer months. You should consider our tips on what to expect from a modern television and how to best protect it. But, if you still run into problems with your TV, remember Asurion provides extended coverage for televisions as well as many other electronics and appliances. Your TV’s manufacturer warranty probably won’t cover some of the most common causes of failure, therefore extended warranties are really worth it. Now that you’ve got the TV size playbook, it’s time to get out there and find the best deal you can. Happy Shopping!